Here’s a close-up look at the constellation Auriga the Charioteer. 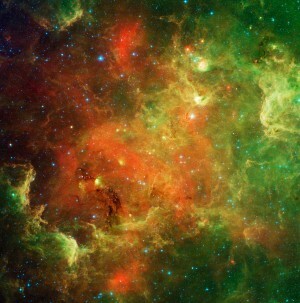 Its brightest star is called Capella. This constellation and its brightest star are easy to identify in the northeast by mid to late evening. If you don’t see them, try looking a bit later at night – especially if you live in the southern U.S. If you’re unsure whether you’ve identified Capella, you can always look nearby for a small triangle of stars. 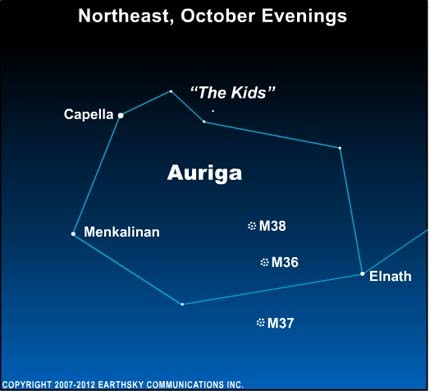 Capella is sometimes called the Goat Star, and this little triangle is known as The Kids. Capella is located at one corner of the constellation Auriga. Capella marks the Charioteer’s left shoulder. Menkalinan, the second-brightest star in Auriga, marks the right shoulder. Also, notice the star Elnath at the southern tip of Auriga. This star used to belong both to Auriga, where it was known as the heel of the Charioteer . . .and to the constellation Taurus, where it represented the tip of the Bull’s northern horn. In the last century, though, the International Astronomical Union decreed that this star shall belong only to Taurus! In a dark sky, using binoculars, you can spot some easy-to-see star clusters within Auriga: M36, M37 and M38. That’s at mid-evening in the northern states and later evening in the southern states; the beautiful star Capella and its constellation Auriga the Charioteer. Previous Story: Don’t miss the rally this Tuesday! Site contents copyright © 2019 Recorder Online	except as noted. All rights reserved. | 89 queries in 2.307 seconds.